For the last couple of weeks the CASology design team gals have been sharing their craft spaces and today I present to you my Craft Cave! I'm going to start to the right of the door for my tour. This area is pretty neglected. It holds all my ribbon and twine for the most part. The bottom shelf has extra adhesive supplies and lightbulbs. The plastic drawers on the bottom hold felt, punches, flowers, Stickles, mists and Cuttlebug supplies. 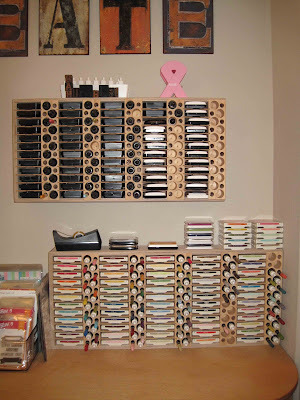 I finally broke down earlier this year and bought some of these awesome ink storage shelves from Stamp-n-Storage. A friend of mine was moving back to the island from the US and since he owed me a favor he said I could put a few things into his shipping container. I never would have gotten these if I'd had to pay for shipping on top of the price of them so I jumped at the opportunity. Luis built this little unit for my washi tapes. The shelves are tilted slightly so the tapes won't roll off of them. 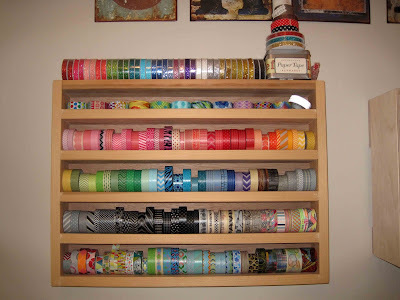 I love it and the rainbow of washi tape makes me so happy! Here you can see my paper trimmer, Cuttlebug, and stamps on the desk. The wooden drawer holds gems, sequins, glitters, etc. 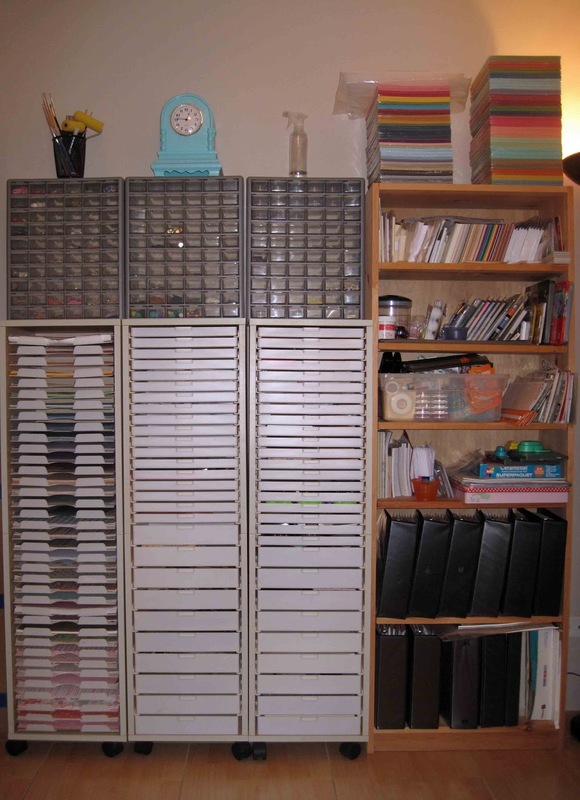 There are Copics and more stamps plus my heat tool on the lower shelf. I love my desk! It's a wooden table came from my old job - it was going to be chucked when they renovated. My most used stamps are lined up (alphabetically) in bins. 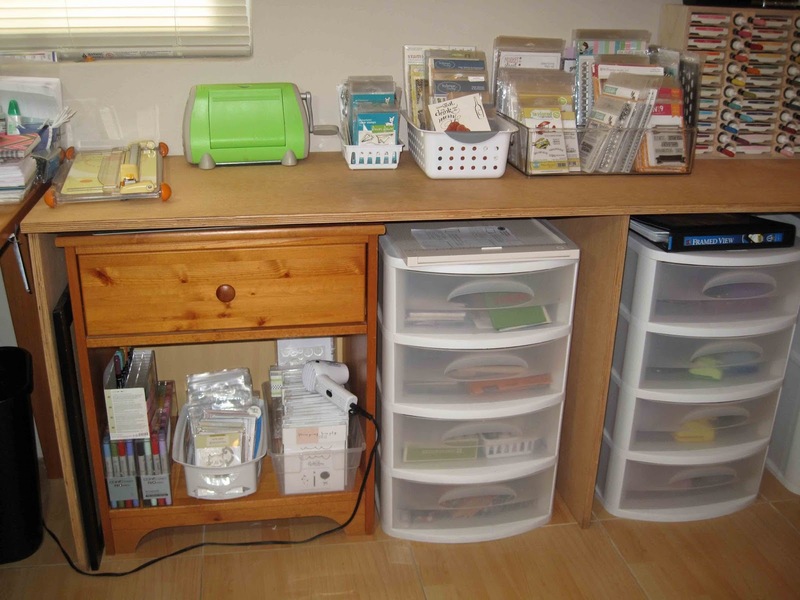 The drawers hold acrylic blocks, adhesive, embossing supplies, markers and other odds and ends. 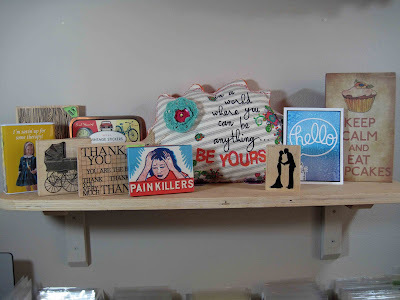 I hang all the cards I've received from amazing blogging buddies above my desk to provide inspiration. The plastic jars are full of flowers and feathers. The CD rack holds my older Papertrey Ink stamps. The little cart holds some cardstock and patterned paper, more sequins and glitter, Christmas stamps and Stampin' Up stamps. Two of the binders hold Stampin' Up paper scraps and the other holds dies. 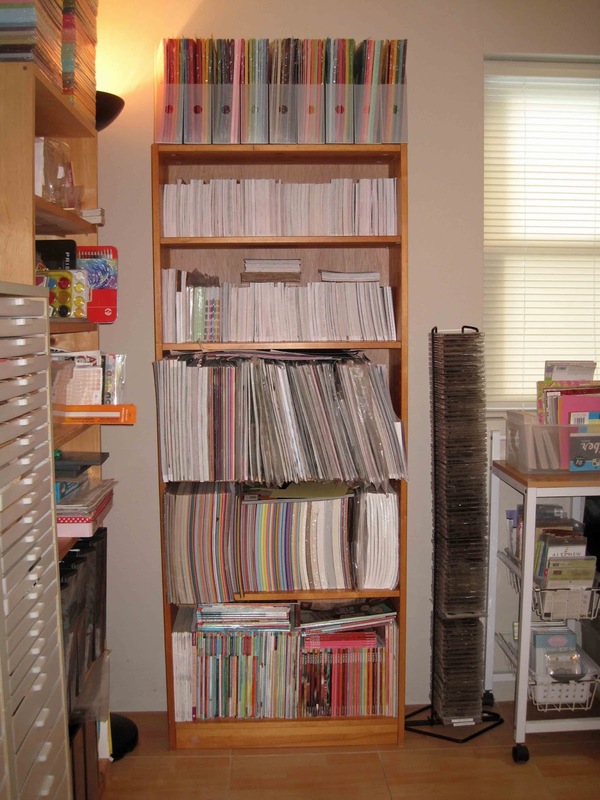 From top to bottom we have Stampin' Up cardstock, 6x6 paper pads, 12x12 paper pads, other cardstock and magazines. The tiny storage drawers at the top hold buttons, seed beads, confetti, eyelets and brads. The white paper trays on the left hold miscellaneous 12x12 patterned papers The white drawers hold wooden stamps, spare cardstock, specialty cardstock (cork, vellum, etc), paint chip samples, tissue paper, etc. On the wooden shelf: extra Stampin' Up cardstock, misc cardstock and card blanks, coloring supplies (coloured pencils, watercolors, markers, etc), extra blades and cutting tools, Christmas odds and ends and lots of binders of Unity stamps. That's it from me! Hope you had fun checking out the Craft Cave. 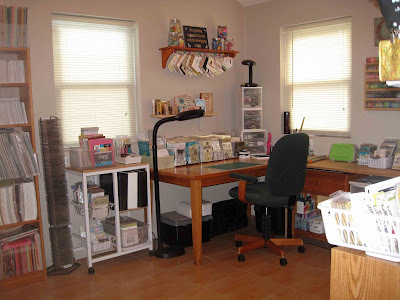 Be sure to stop by the CASology blog tomorrow to check out Hannelie's work space! Love your space Jen! Awesome organizers! Awesome space Jen... Now I wonder why I chose to go after you! You make me want to come and craft with you!!! Such a vibrant, wonderful space to work! You have everything organized so well! I love that Luis made you a custom shelf for your washi tapes! Wow! What an organized space! Love it! Thanks for sharing! 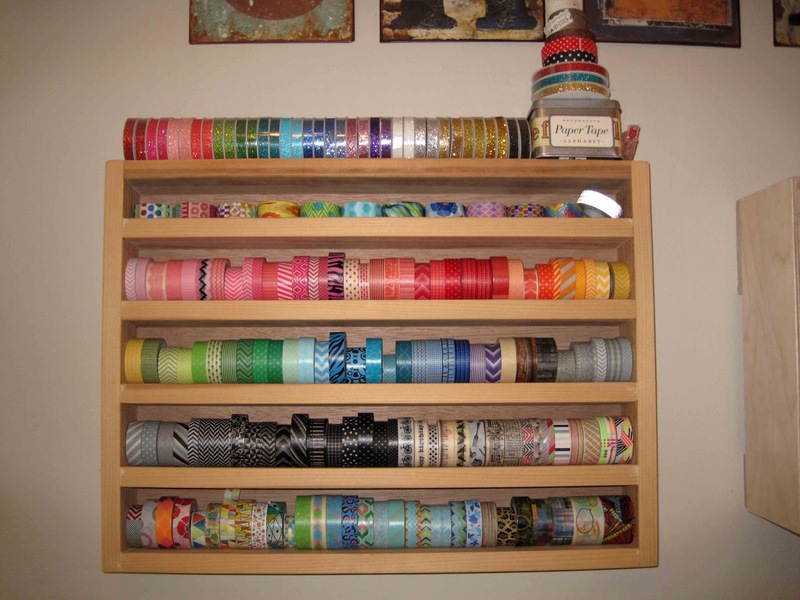 Looking at the shelf of rainbow washi tapes would make me happy, too! Wow! You have an awesome space, Jen! Thanks for sharing! My first thought that it is not in any way cave-like - it looks bright and happy - amazing what paint can do! Second - proud to see a card from me on your 'wall of honour'! Lovely, organized space! Fantastic place to 'play cards' Jen!!! I'll be right over!!! wow, this is amazing...you have lots and lots of goodies.....very nice! The Craft Cave is quite awesome! Not very cave-like at all. So organized, and so much fun stuff to play with! Where are the pet beds, though? OMG! your space is fab! You've given me much needed inspiration! Oh WOW!! your crafting space is just fabulous and beautiful Jen, I love it that you have your supplies in plain view, organized and at hand. 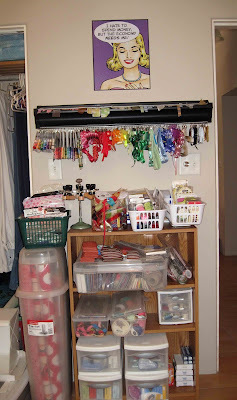 That is how I have my craft room, I need to see my stuff or else, it might get neglected. Thank you for sharing your beautiful, bright and fabulous space with us. WOOOOOOWWW! What a haven of heavenly delights, Jen!! I have stars in my eyes, and cannot get over how everything has its place!!! I also love all your little nick-nacks that make the space uniquely yours. What an amazing place to create!! Lucky I don't live too close. I would probably be pestering you for 'crafternoons'! My goodness you have a lot of stuff and I will need to show my husband I have a lot of buying to do. Thanks for sharing Jen. What a beautiful space Jen. So organized and I love the sunlight. Thanks for sharing! Hey Jen!! I love your space!! Oh man, you do have a lot of stuff!! I love your storage system. I need to get shelves for my walls. I could really see my stash better if it was in front of me. I was like you, I use to buy everything I see. I'm trying to cut back. LOL!! I love that everything is wood. Wood is so pretty to take pictures on top of. It gives a natural feeling. Awesome space and thanks for sharing. 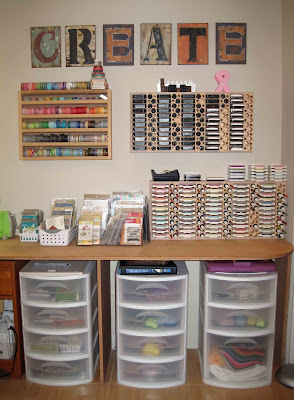 Wonderful craft cave, Jen. And, your new animal friends are too precious. Girl, I NEED you to organize my paper!!! LOL!!! Love your space and all your inspirational bits and bobs!!! Thanks for the peek into your crafty space. It is so bright and I love it when the sun comes in to make my day. 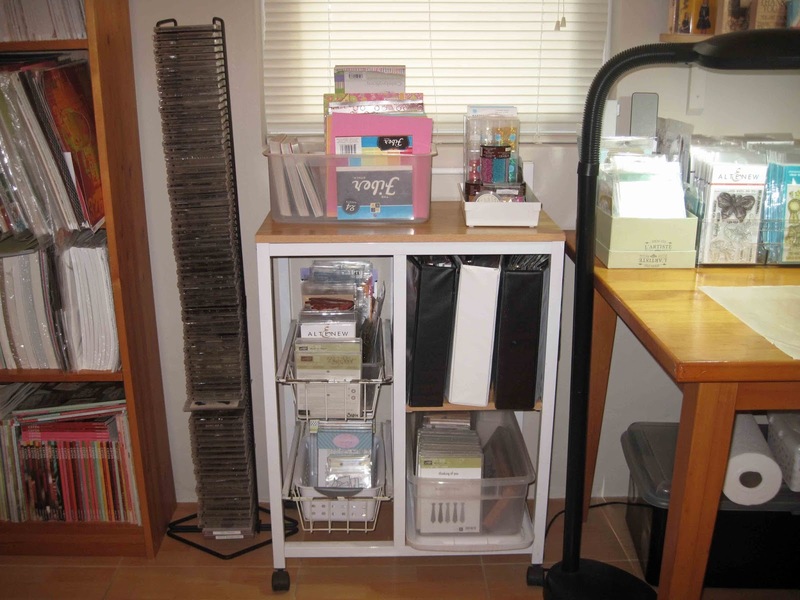 It is so neat and I love all the organizing items you have. And I thought I had a lot of paper. 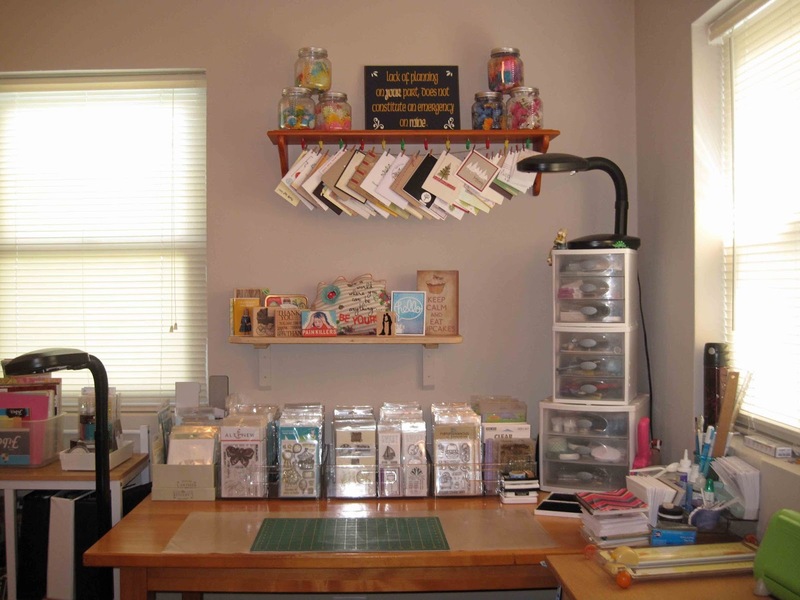 Great tour of your space, Jen, and I love those Stamp-and-Storage ink units myself. I have two that I've had for years and then added another one that turned out to be not the size I wanted so I made it into embossing powder storage. Nothing like a cave at all Jen, I love how bright and cheery it is and all of your fabulous organization. You have a place for everything and a great table to create on. I think Lus comment about why are you buying more is so funny--I have heard the same comment from my hubby! I love that you have your card received hanging above your desk. Your paper shelving is amazing and once again so organized! Thank you for sharing your space Jen! Holy cow, Jen. You really do have a lot of stuff. Perhaps you should open a store. It is fun to see where your magic happens. Wow! Look at all your cool stuff, I could get lost in there for ages and have so much fun playing! thanks so much for sharing your crafty space and I'm glad the dark walls are gone, it looks so light and airy for a 'cave' lol. What a fantastic studio, Jen!!! You do have a lot of stuff, but it's all so well organized! Right now my craft studio looks like a tornado came through. It's a total unorganized mess! Hoping to do some major clean up and organization while my puppy is away at training camp. Thanks for the inspiration! Wonderful space! 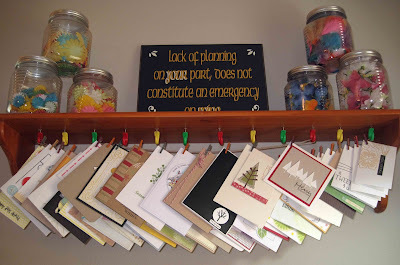 I love the "CREATE" on the wall and I must start hanging the cards instead of putting them in a drawer. They are great for inspiration.